There could hardly be a more appropriate nickname in Australian cricket than Rhino. 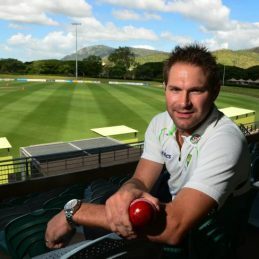 Whether an adaptation of his first name or a comparison to the stampeding animal, it fits Ryan Harris perfectly. A hulking fast bowler who charges in and tramples the hopes of opposition batsmen, Harris delivers wickets in bulk. The only problem for Australia is a long and varied list of injuries that have kept Harris from playing anywhere near the amount of Test cricket they would have liked. He was also a late entrant to international cricket, debuting at the age of 29. For the first half of his career, Harris was little more than a journeyman medium-pacer with South Australia. A significant boost in pace came from increased strength and fitness, and by the time he moved to Queensland in 2008 – via a mistaken signing with Sussex on a British passport – he was a genuine fast bowler. His first season with the Bulls brought 33 victims at 26.48 and Australian honours weren’t far away. His debut Test series in New Zealand in 2010 brought nine wickets and later that year he claimed nine in the Perth Ashes Test, but in the following match his intensive method of exploding through the crease led to a broken bone in his left ankle that required surgery and ruled him out for half a year. Harris already had a chronic knee injury that will be with him until he retires, but when fit he is invaluable. A hamstring injury ruled him out of the last Test in Sri Lanka in 2011, but already his five-for had helped deliver victory in Galle and his late movement helped make him Australia’s leading wicket taker. He flew home from the South African tour later that year with a hip injury that caused him to miss five Tests, and on the West Indies tour in 2012 he was controversially rested for the middle Test of a three-match series. Shoulder surgery in the 2012 winter meant he missed the whole 2012-13 international summer, but a return late in the Sheffield Shield season was encouraging. Despite picking up an Achilles tendon injury in the IPL, he was able to play in the 2013 Ashes in England. Australia’s selectors desperately wanted him for that tour, despite the fact that he had not played Tests for nearly 15 months. Despite being left out of the first Test, he was Australia’s Player of the Series in the Ashes defeat and his 24 wickets at 19.58 included a career-best 7 for 117 at Chester-le-Street and a five-for at Lord’s. One of the few Australians to emerge from that tour with his head held high, Harris was also named a Wisden Cricketer of the Year. Few people expected him to last the full Ashes series at home, given his history of injuries, but Australia’s selectors stuck with him throughout and he repaid them with another outstanding campaign. His 22 wickets at 19.31 put him second only to Mitchell Johnson, and he was Man of the Match at the SCG for his eight-wicket game. He delivered another victory in Cape Town with a bustling and tireless effort late on the final day of the series, with 4 for 32 against South Africa. Knee surgery awaited him immediately when he returned home, but he was able to recover over the winter and play in the home Test series against India. Ryan is now helping nurture future Australian players at the Australian cricket academy in Brisbane and working with Foxsport.